NICOSIA, Cyprus (CNS) — A prominent Syrian Christian political leader has warned of an impending assault on the northeastern province of Hassake amid reports that thousands of Islamist fighters are preparing to take control of the predominantly Christian and Kurdish area. 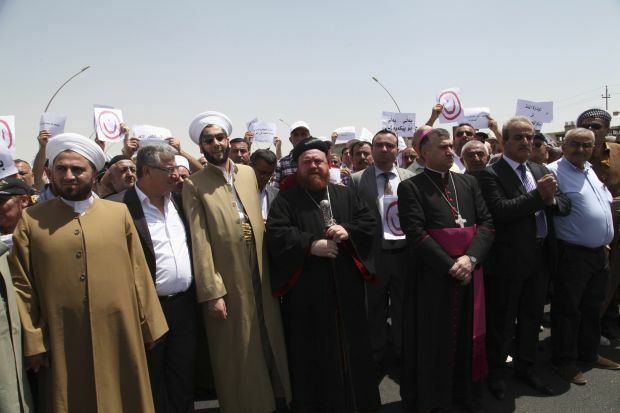 Bassam Ishak, president of the Syriac National Council, said July 24 that Syrian Christians do not want to suffer the same fate as their co-religionists who were brutally driven out in recent days from Mosul, their historic homeland in northern Iraq. There, Islamic State militants told Christians that they had three options: convert to Islam, pay the Islamic jizya tax or leave Mosul. Other Christians are known to have been executed by the group. Numerous Christians who fled the besieged town were robbed of the few possessions they took with them, including money and gold jewelry. Islamic militants known as ISIS or ISIL, recently rebranded as the Islamic State, have solidified their control over Iraq’s second-largest city of Mosul by imposing Shariah, Islamic law, and expelling Christians who will not convert to Islam. Islamic State has also destroyed churches and other religious buildings, including a famed mosque, where the biblical prophet Jonah was believed to have been buried. “Now we are hearing reports that ISIS is moving artillery, weaponry and fighters. We heard the report of 20,000 fighters coming from Iraq and preparing to take the (Syrian) city of Hassake,” Ishak told CNS. “We are in a fight for our existence because I don’t think a Syriac will accept to live under Shariah law, nor will a Kurd,” he said. Syriac Christianity dates back to the first century and embraces Catholic and Orthodox traditions from East and West. Aramaic, the language of Jesus, is featured in its religious services. Ishak was in Cyprus for meetings with Kurdish Democratic Union party leader Saleh Muslem Mohamed, with whom he has formed a cooperation compact. The Kurdish Democratic Union Party, which controls Syria’s Kurdish region, has established an unofficial autonomous Kurdish region in Syria which is now eyed by Islamic State as its next conquest. Both leaders are calling on the world community’s help to stop another Islamic State rampage. “Today, they are persecuted. Our brothers are persecuted and hunted away; they have to leave their homes without being allowed to take anything with them,” the pope said of those escaping Mosul. Although some Syrian Christians have pledged their allegiance to the government of President Bashar Assad, others have stood against the regime because of its torture and killings of dissenters. Now, they fear Assad may be willing to allow Islamic State to deal with the regime’s perceived enemies. “We supported a revolution for a democratic, civil Syria that is pluralistic, that separates religion from politics and leaves faith in the public realm. (Islamic State) ISIS has a completely different vision,” Ishak said. In the Syrian city of Raqqa, once home to an active Christian minority population and now controlled by Islamic State fighters, all three churches have been shut down.